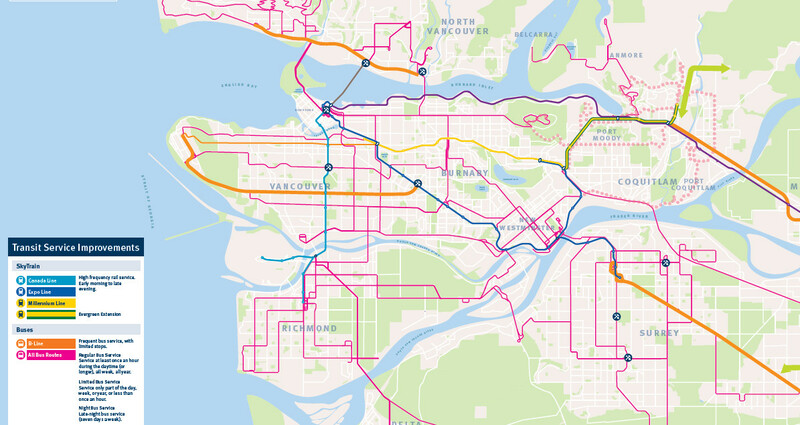 TransLink’s service levels are increasing rapidly, and a new funding plan should allow continued expansion — for a while. Transit service has reached into new areas, and people are responding, especially with the opening of the Evergreen extension of the Millennium line to central Coquitlam. There was a 5% increase in Metro Vancouver bus service hours in 2017, and a 17 per cent increase in SkyTrain service hours. 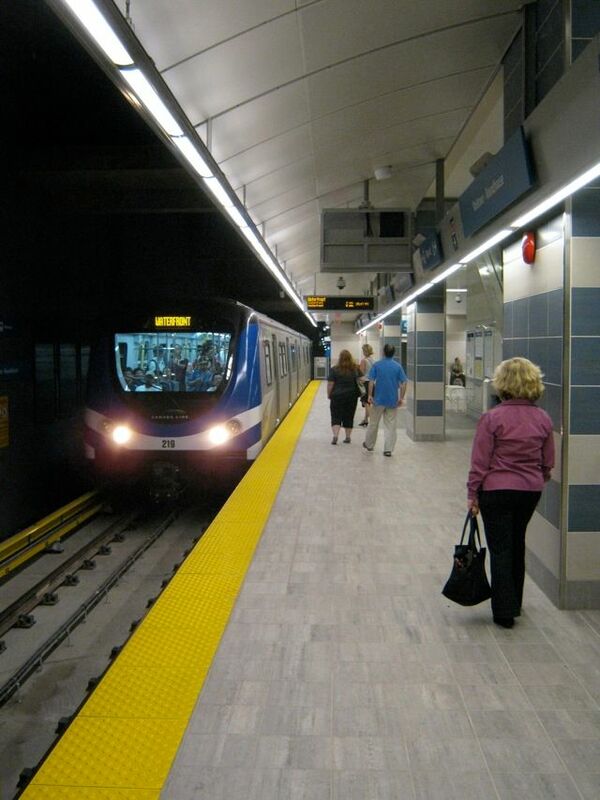 And after a 10-week delay following approval in principle, the council of transit mayors voted on June 28 to fund further improvements to bus service, upgrades to transit stations, and new rapid transit construction. As I wrote here in April 2018, the money is to come from fare increases, property taxes and development cost charges, and increased revenue from higher transit ridership. The structure, however, is fragile. The Government of B.C. announced on June 28 that it will fund its share of transit through a 1.5-cent increase in the regional fuel tax. This is a politically risky move. Metro Vancouver already has the highest fuel taxes in Canada [sez Wikipedia] at 45 cents per litre. 17 cents of that is dedicated to transit, but the people who drive the furthest — those in the deep suburbs — are least likely to have access to frequent transit. Suburban voters in Ontario recently elected a provincial party that promises to cut fuel taxes by 10 cents. The next B.C. government — which could land on us in 2019 — may decide to reduce fuel taxes and transit funding in a populist appeal to motorists. The funding trend in the United States is certainly clear. 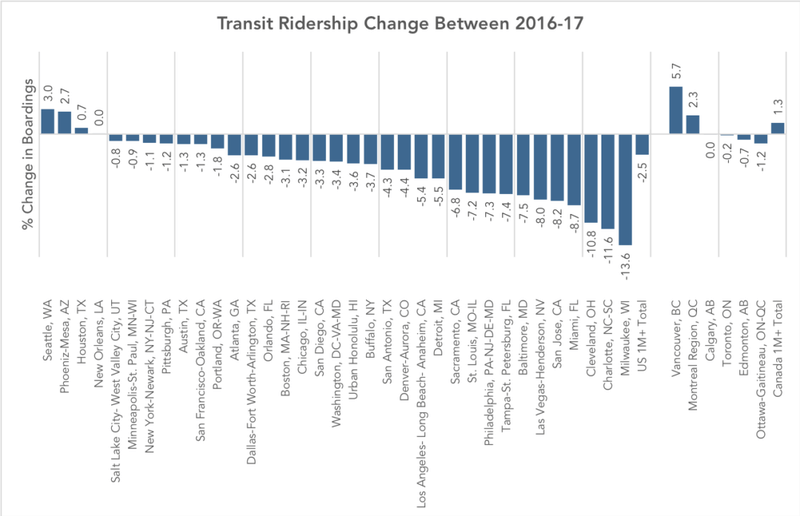 CityLab reports that transit ridership declined in 31 out of 35 US urban areas in 2017 primarily because public agencies are cutting service and there are fewer buses to ride. In Toronto, meanwhile, transit system revenues are forecast to drop slightly in 2018. Combined rapid transit and bus ridership has been flat in that region since 2014. Even in a position of leadership, however, TransLink faces continued criticism from passengers and politicians who want even more service. In the City of Vancouver and the inner suburbs, bus overcrowding is an ongoing problem. Route 99 from Broadway to UBC is overcrowded more than 30 per cent of the time. The 25 and the 49, also linked to UBC, are overcrowded almost 20 per cent of the time. Bus route 100, which runs along Marine Way from New West to the Arthur Laing Bridge, is as bad as the 49. Some of the cash that could be used to relieve that overcrowding is going to support lightly used routes in the deep suburbs. In Maple Ridge, for example, Mayor Nicole Read has often complained that her community is poorly served, and voted against the June 28 funding package. As it happens, three of the eight most inefficient bus routes in the region serve Maple Ridge. Route 99 to UBC carried passengers in 2017 at a cost of $0.79 per head; the 741, which serves Mayor Read’s neighbourhood, came in at $11.58 per head. The 2017 winners in the Metro Vancouver inefficiency contest, by the way, were the 259, bringing occasional passengers from affluent Lions Bay to an exchange in Horseshoe Bay at a cost of $17.44 per head; and the 609, a shuttle running from the Tsawwassen First Nation to a nearby bus exchange at a cost of $21.92 per head. This is the cost of operating a big system in a politically fragmented region. Negativism aside, we can look forward to some interesting developments in 2018-19, including the start of express bus service from — well, well — Maple Ridge, as well as accelerated progress on rapid transit in Surrey and Vancouver. Let’s spend until the money runs out. This chart copied from StreetsblogUSA. Yes lets spend till the money runs out….better yet lets spend wisely till the benefits of spending on transit become clear. To me this means high quality transit that goes to where people are going…That likely means expensive projects with high payback (Broadway Skytrain) but could also mean upgrading B-lines or busy bus routes with proper spacing, signal priority, cue jumping lanes, dedicated bus lanes etc. It is amazing this never gets any attention in Metro Vancouver. Unfortunately the current Surrey LRT project does not fit the bill for quality transit or for wise spending. I am not sure how an entirely at grade system is forecast to cost so much but if we are in for 1.3 billion we should kick in a couple of hundred million more and fix the stretch from King George/104th street to King George station, that will be a disaster from day one (and limit future capacity of the system – it is the pinch point in the system for signal priority) and put a bad taste in the mouth of Metro Vancouver residents when considering future projects.